Everyone is in a better mood when CD Tenerife win. After this 2-1 home victory over Zerex the young ladies working the street near my bus stop flocked around me to discuss the game, good job they said, well some sort of job was mentioned. Ok maybe they weren’t bothered about foofball but I couldn’t have been happier, a convincing win and out of the relegation zone above Las Palmas, how sweet. 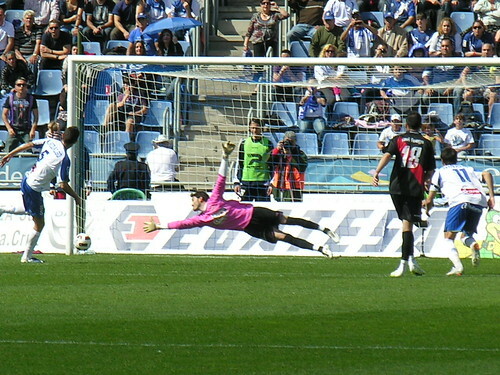 Tenerife looked determined from the kick off, Julio Alvarez forced an early save from a corner and Dubarbier shot high from the edge of the box. The midfield was struggling to take control despite another impressive display from Kitoto and Xerez showed they would be no pushovers. Tenerife have bags of confidence these days and stuck to their task, Julio saw his shot hit the post after 25 minutes and Bernager had an effort deflected off target. Pablo Sicilia was unable to make his interview with me last week and I joked that he owed me a goal, blimey he certainly delivered, Julio swung in a corner and Pablo was there waiting to score his 5th goal of the season, this time with his foot rather than another header. 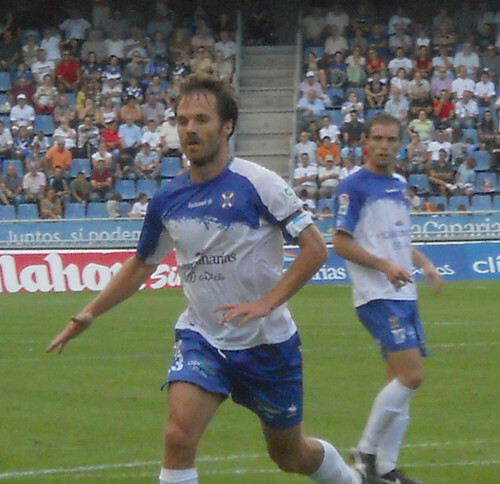 The second half opened with Sergio Aragoneses looking sharp to turn aside a Redondo shot for a corner but Tenerife were soon pushing forward. Pablo was sniffing around in the box when Bermejo fouled him and the referee awarded a penalty. Hidalgo was cool as he stepped up and easily converted the kick for a 2-0 lead. 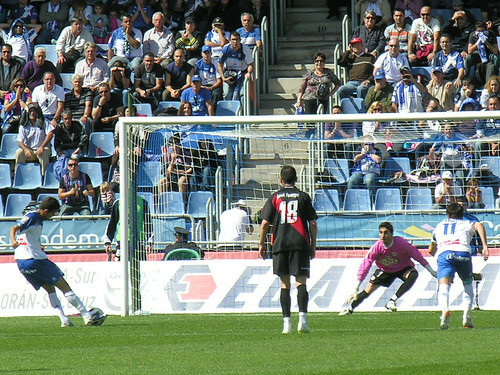 Even in these improved times, lapses in concentration can prove costly for Tenerife, just a few minutes after the penalty Xerez broke and Cordero found a clear route on the left before slotting the ball in the corner of the home net. That could have marked the way back for Xerez, Sergio produced another superb save, this time from Vega, Capi also came close but Tenerife held on for a deserved win. Despite the Friday night scheduling for television, another 16,545 crowd was able to savour the winning feeling. 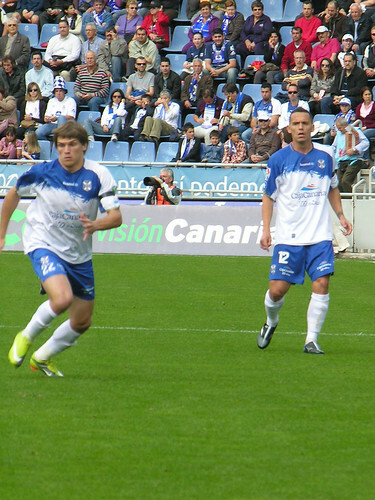 Tuesday there is a tricky game at Cartegena but Tenerife will be confident of pulling away from the trap door. This should have been a useful goal less away draw for CD Tenerife but with 2 minutes left a well taken Celta Vigo goal was poor reward for a strong disciplined display by the visitors. There was an enforced change in the centre of defence with Melli slotting in to replace the suspended Pablo Sicilia who joined the Armada Sur down at The Royal Oak in Las Americas. 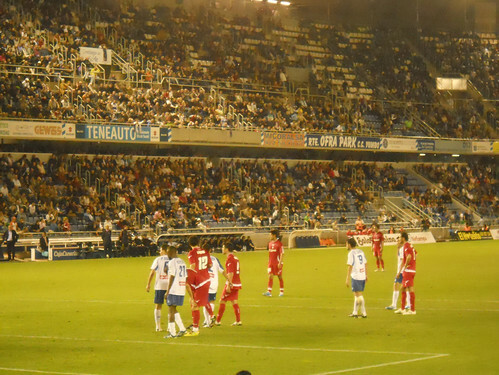 Celta are a good side and worthy of their second place in the table, they started strongly and gave Tenerife plenty of problems, with former Pio Trashorras threatening to be the spoiler. The turning point came after 20 minutes when a Celta raid became a mad goalmouth scramble, a home player swung a boot and missed but it was still goal bound when Melli scooped it off the line. A few minutes later Dubarbier latched onto a through ball and ran on to score but the referee called it offside and there were few complaints from the Tenerife players. Nino had a couple of decent chances but couldn’t make them count and at half time it didn’t look a bad scoreline. Melli had a good header saved early in the first half, Kitoko was again looking speedy and strong but after a sending off in his first game he left this time with an injury. At least his departure marked the return of Mikel Alonso (pic) but Tenerife lacked a bit of inspiration up front and a draw looked almost certain. Celta showed their class in the dying moments as a defence splitting pass found Michu who finished with ease to grab the win. As the goal went in our guest Pablo Sicilia must have learned a few new interesting English words, he will return to action for Friday nights home game with Xerez. 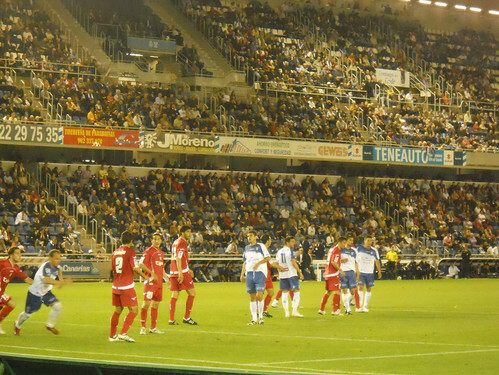 This was the big test of the new look CD Tenerife, following last weeks great win at Salamanca the Segunda Division leaders came to Santa Cruz and to be honest pre match most of us would have settled for a draw. Coach Tapia had other ideas and for the first half the home side more than matched their opponents. 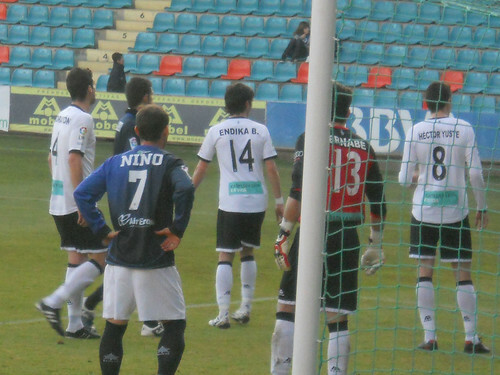 Left back Beranger had a rare goal chance after 7 minutes but it wt that as not enough to test Rayo’s CobeÃ±o in goal. The Madrid based team were big and strong and Tenerife didn’t help themselves at time by giving the ball away too easily. Dubarbier gets better with each game on the left but was always looking over his shoulder to make sure Beranger was covering at full back and after 20 minutes Dubarbier picked up a booking for hand ball stopping a Rayo break away. Dani Kome was making good progress down the right side but was wrestled to the ground several times, or were they pre Valentines cuddles? TV giants Canal Plus were the reason for the 11am kick off and at our end it was noticeable that the camera operators were women, what on earth would Andy Gray have to say about that! Going into the break it was level and goal less with good reason to enjoy the hot sunshine but it’s all about goals. Rayo aren’t top for nothing and had plenty of fire power but returning home keeper Sergio Aragoneses was on top form easily taking a Piti free kick just after the interval. 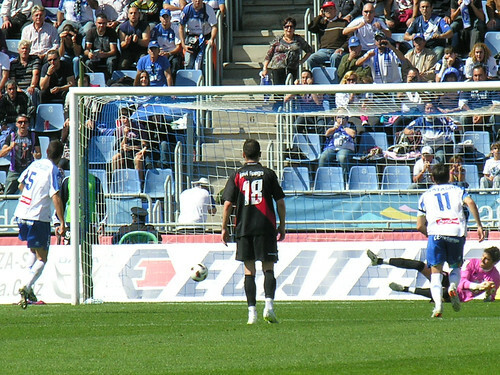 With 62 minutes gone Arribas handled in the box and the referee pointed to the spot, Hidalgo stepped up and fired it in for the lead (above) but the fussy ref called an infringement and ordered a retake.Hidalgo kept his nerve and sent the keeper the wrong way (below) to delight the home fans. There was better to come as Nino won the ball to the left of the goal area and lobbed it delicately, it hung in the air but eventually arched down into the goal, a superb bit of skill. Tenerife had to withstand a Rayo fightback, Sergio was masterful punching clear as Piti bore down on Bertran and luck was on our side as Rayo hit a post and the shot pinged back onto the legs of Pablo Sicilia but rebounded just past the post. Time was ticking away when the ref threw a spanner in the works, calling Sicilia for a push in the box and awarded a penalty to Rayo, Armenteros scored and the four minutes of injury time were sheer agony especially as Gomez had a clear last gasp shot but could only direct it into Sergio’s hands. The whistle was greeted with joyous celebration, apart from the near 200 Rayo fans on the upstairs tier above our home stronghold, how did security let them get in there? Thankfully a happy ending but it doesn’t get any easier with 2nd placed Celta Vigo away next week and the aftermath of another 6 bookings bound to disrupt the starting line up. On the plus side big new striker Igor has still to taste action and even sweeter, Tenerife are now just one point behind the Pios. …Are there enough double entendres in that title? If you think I’m being rude, shame on you, all will be revealed phnarr phnarr. A funny thing happened on the way to the bus stop today. It was an early start for me from Los Cristianos to Adeje to cover the European Day of 112, the emergency service here in Tenerife as in most of Europe. Getting on the bus there was the usual little scrum down when suddenly a second driver sat up front on his way to the station leant out and shouted at people to hold their bags tight and gestered at 2 men in the middle of the melee. The Titsa bus driver then pulled out his mobile and rang the police as these 2 men made their melted away from the scrum. There has been some problem with pick pockets at the Los Cristianos main bus stops and this observant driver had recognised the 2 culprits and did all he could to warn people. The chancers got away but it’s good to know that someone is looking out for us, often there are now plain clothes police patrolling the area and they have nabbed quite a few scum bags. 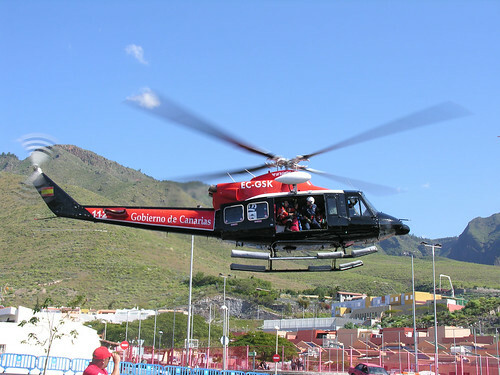 All very appropriate as the 112 eventÂ Â I was headed to included representatives from nearly all branches of the Tenerife police force as well as ambulance, fire and rescue staff. It was a fabulous show and tell morning with pride of place going to a government rescue helicopter that had the many school kids attending spellbound. The climax, oh there goes Finbarr again, was a reconstruction of an emergency car rescue involving the chopper dropping in medical staff and air lifting the dummy passenger. You can read a full account af that at Tenerife Magazine. Back with the buses and lots of changes going on, you may have noticed the new stream linedÂ bus stops reflecting the new logo on the buses with no emission exhausts. There is also a new timetable so throw away those old fold out map formats and pick up the new booklet style, damm it’s too tall to fit into my shorts pocket, no consideration. 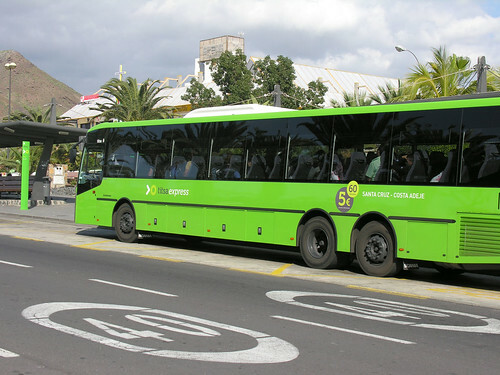 Titsa have also taken delivery of a fleet of new mini buses for short hops around urban areas and hope to have the new La Laguna station open by Easter. The 112 open event finished at 2 pm, before the word got around that today would be a good day to go on a crime spree elsewhere. I was long overdue a trip up to T3 – Tenerife Top Training in La Caleta to see what was cooking up there so headed across on the bus. You may recall that T3 was were Robinho did a bunk from his Man City team mates a couple of seasons ago, hope they come back soon, be worth it to see Tevez sat in the scorching Tenerife heat still wearing his snood. 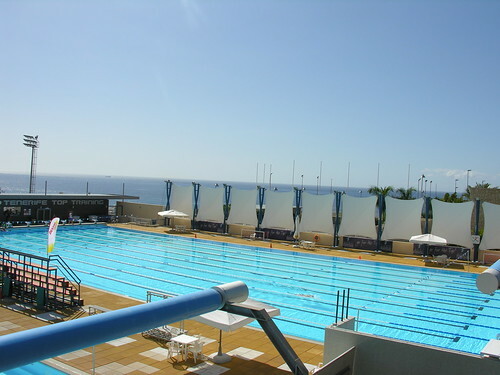 The football pitches are just a part of the complex, the swimming pools are used a lot by Olympic swimming teams and many a top athlete has used their state of the art gym to pump some iron. It was pretty quiet for my visit, just a few rippling the water and some keen volleyball players kicking up the sand on the beachÂ area. Hopefully I will get a nod next time a big name football team takes a break at T3. 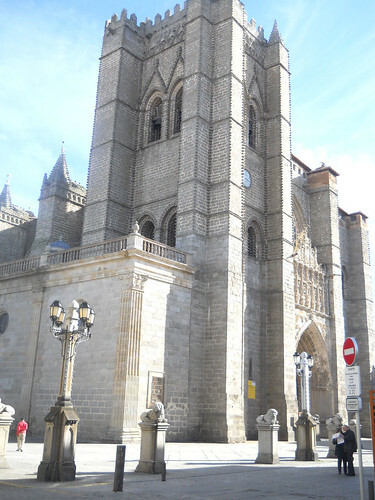 There was no early church service for the Armada Sur, honest we would have, it was mid morning as we emerged from our after celebration slumbers, you can’t let a 2-1 away win in Salamanca go unmarked. 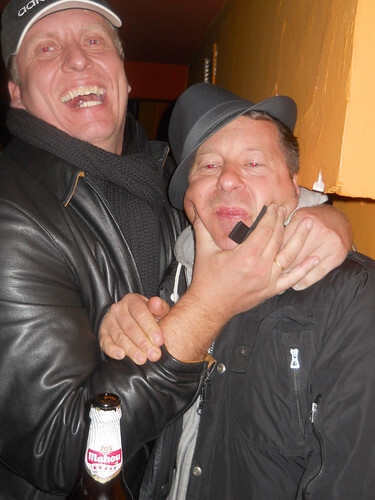 First shock of the day, if you ignore the horrendous hangovers, was finding that Gordon (AKA The Moron) had fallen over (damm unsteady those local streets) the night before and had paid a visit to the hospital for 4 stitches above his eye. That was in the second group across town, myself and Andy did a zombie walk down the road from the hotel for a coffee at a service station but both found a chocolate pastry too much to stomach and left them part chewed. 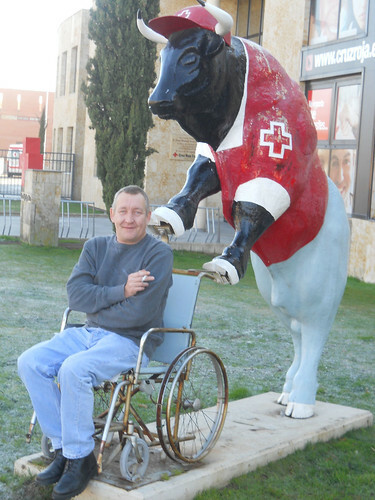 At least we managed a chuckle as we found a bizarre statue to pose with, clearly someone had more warped minds than us. The General turned up in reception looking like Keith Richards on a bad day and we headed into town to meet the others, obviosly we didn’t mock our injured comrade Gordon in any way at all, even if he looked like Rocky 1, 2, 3, 4 and 5. All safely gathered aboard the trusty mini bus we set off for Madrid with a half way stop at Avila penciled in. 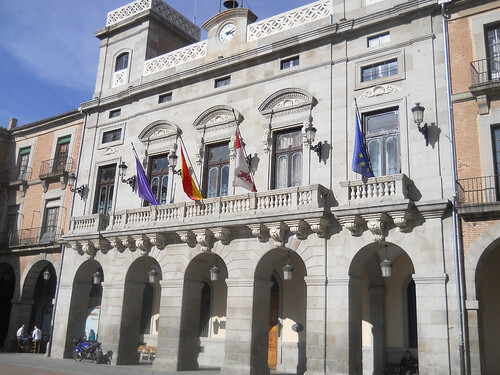 There had been some suggestion of taking in a Tercera Division game in the small historic town but with an eye on seeing the Chelsea v Liverpool game in Madrid we just took a meal break. Avila is stunning, a medieval fortress wall embraces the town and after food we drove inside the battlements and had a quick poke around the plaza (above) and cathedral. 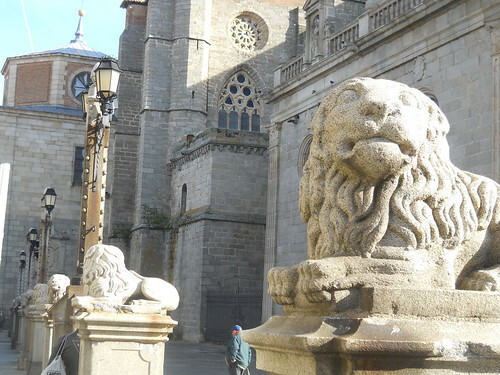 One of the big pluses of popping over to CD Tenerife away games is the chance to taste some of Spain’s history, the cathedral was built in 1095 and is surrounded by a pride of stone lions. 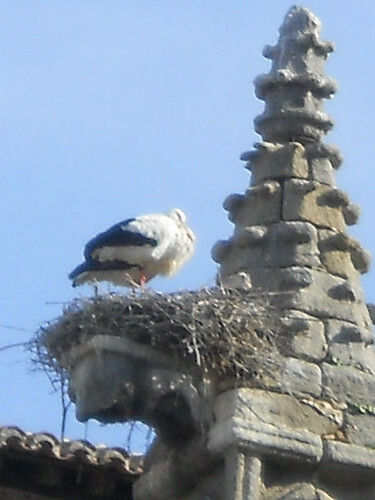 Looking up to the buttress’s I could see and hear large storks that had nested on the turrets, they were huge, no use offering them a bag of crumbs and a bit of bacon fat, they looked capable of swooping down and stealing a small child – we kept a close eye on The General. The wheels of the bus were soon going round and round again as we neared Madrid close to kick off on the TV game, The General headed to the hotel after dropping us off near a Metro (underground)Â station. 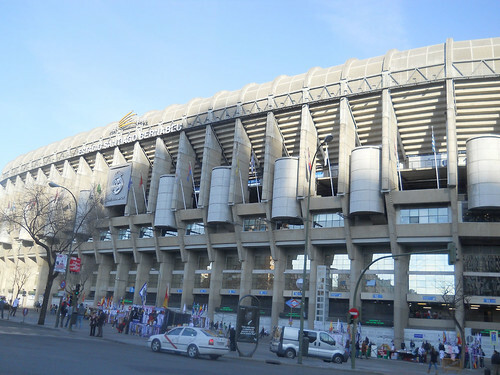 It just happened to be by Real Madrid’s impressive Bernabeu Stadium,Â DJ Johnny looked a little conspicuous in a CD Tenerife track suit top but it was several hours before Madrid’s home game with Real Sociedad – and no I wasn’t even tempted to go. Madrid is a great city and the Metro is just one euro for any journey, we had to change at Tribunal and Johnny our resident scouser peeled off to watch the match with the Madrid Reds at their Cavern look alike, The Tavern. The rest of us emerged at Sol, the city centre Metro stop and took the side street to our regular haunt the O Connell StreetÂ Bar, a big popular sports bar where the order of the day is a bucket of Coranita beers packed in ice and large baskets of crisps to tuck into. Liverpool’s win merged into another victory for the local white menace, then with a ridiculously early wake up in mind and Johnny back with a contented look on his face, we adjourned to the local kebab house for a suitably greasy nosh up. This is another part of the Madrid ritual in a food house that features a large painting of a horse on the wall – they didn’t did they? Time for a bus back to our Hotel Torre Laguna, and like the Metro the bus was also just one euro. I grabbed a couple of late beers at the bar before kipping down for just over 3 hours only to rise like a zombie for our return trip to the airport to return the minibus and pile onto the plane. A gorgeously sunny Tenerife morning welcomed our return to the island blinking in the light like pit ponies that hadn’t gone to Specsavers. Good company, good fun and good grief a win, now for the rest of the season. Like a bizarre new version of the A Team the Armada Sur minibus inched its way out of Madrid airport car park, B.A and the boys would have been making impressive weapons out of scratch but we would have settled for working out how to open the windows. Never mind, it was cold outside so we settled for snug and warm as we headed up north to the snowy hills on the way to Salamanca. The two and a half hours trip passed pretty quickly especially after we loaded up with beer at a petrol station stop, it was like christmas for them as we plundered the expensive cans soaked up with nosebags of crisps and doughnuts – well it’s good to have a balanced diet. We had alaready lost Tolf at the airport, his residencia was out of date and a couple of hundred euros to book a new flight would have dwarfed the mere 10 euros we paid for the Ryanair return trip. There was a hopeful mood as the snow in the Salamanca fields became deeper and the mountain range glistened in the sun. Arriving an hour before the game we headed straight for the ground, parked up and hit the nearby bar, it was small and basic but we spilled outside as more and more CDT fans joined the pre match jolly with some good natured locals enjoying our songs and antics. It got a lot colder inside the ground but we had a good spot just behind the goal close to the pitch with just a few stewards seperating the near 200 Tenerife fans from the touchline. It was an encouraging start, Bertran looked more comfortable and tested the home side early on with a raid down the right. Salamanca had lost 8 games on the bounce but surprised us with Moraton heading home after 25 minutes, making the most of a hesitant defence. Kitoko was making his debut in the holding midfield slot and looked strong and purposeful but Luis Garcia in goal had a few juggling moments to keep us on our toes. Pablo Sicilia is on hot form and on the half hour he rose majestically to head in an equaliser, bringing a noisy response from the travelling chicharreros. Tenerife looked more confident and had the better of the second half, Alvarez came close to beating Bernabe in the home goal and Natalio wasted the best chance of the game. New striker Igor was on the bench but coach Tapia was in no hurry to use him, Sicilia is revlling in his new role as a goal scorer and after a poor attempt to clear from a corner launched himself at the ball and headed it into the net. 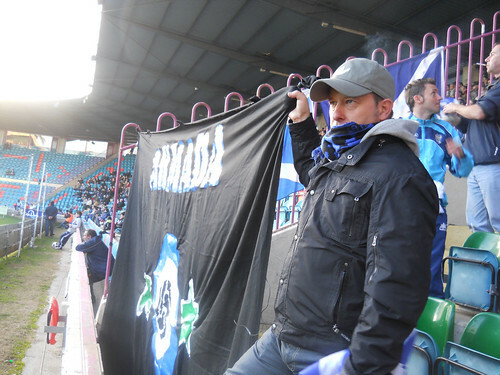 The home fans turned on their team and coach as our fans grew louder with the players clearly enjoying the support. Salamanca responded by bringing on ex Pio Marcos Marquez, my how we enjoyed taunting him, even better as he was clearly riled by it. Holding on to a lead has been a problem and when Kikoto was sent off for a second yellow card after 79 minutes every tenerife bum was squeaking. Coach Tapia clamped down the defence by bringing on Melli and Juanlu for Alvarez and Nino and it did the trick, the final whistle spawned a crescendo of noise from our blue and white sector as the players and Canarian media flocked to share our joy. Leaving the stadium in full cry we were rudely interupted by a small gang of home nutters armed with flares and home made batons but thankfully they were repelled by our more vigilant fans. Even that could’t dampen the mood, we regrouped and caught our mini bus to the Hotel Recoletos for a quick check in, change of clothes and out on the town. On the way in earlier we had already been impressed with the beauty of the viaducts general layout of Salamanca and with our local guide Juanma we combined sight seeing with drinking. 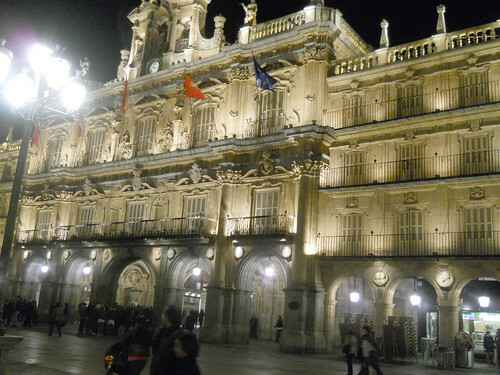 It’s a big student city and had a vibrant feel to it, Plaza Mayor was a wonderful ornate and stylish centre piece and provided a great first floor window view froma posh bar restaurant where we watched the Barcelona game. A tour around the back streets around the cathedral impressed us all even in our lubricated state. Karen needed a toilet stop so we dived into a small non descript bar only to find it bouncing with Tenerife fans. We knew this was the place for us as our feet stuck to the floor and they played some fine tunes including The Smiths. By this stage our original group had fragmented with some relocating nearer to Juanma’s family home. It was around 3am that I headed back to the hotel via a kebab shop, well we had to eat eventually. Poor Andy my room mate was serenaded by my gold medal snoring as I went into an instant sleep, elsewhere the night still had more surprises.